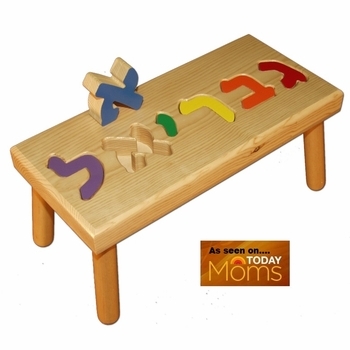 This personalized child’s stool with Hebrew puzzle letters is quality made from solid wood and makes an adorable Jewish baby gift for the new arrival! Standing nine inches tall, the stool top measures 9” by 20” for names with five letters and 9” by 24” for names with six or seven letters. We recommend that you confirm the Hebrew spelling in consideration that any name can have multiple Hebrew spellings. Click --> Hebrew Name Translation to translate an English name to Hebrew. Confirming the Hebrew spelling with the recipient is recommended, due to the fact that one name can have multiple Hebrew spellings. See More Images above to see letters and characters. NOTE: The letters will appear on the stool as entered in the Child's Name field. We will not reverse the letters. The example 13,1,10,25,2,3 is the stool pictured. Please separate each number in the child's name field with a comma. A heartfelt personal message or birth information may also be engraved on the back. It’s also an ideal gift for birthdays and holidays. Allow approximately two weeks for shipping.